Integrating Research and Education > Yellowstone > Compelling Research Questions > Is volcanism caused by a deep-seated mantle plume? 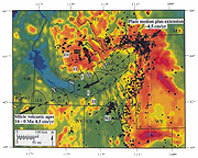 The following topical questions and selected resources are designed to guide you through the current debate on the origin of Yellowstone hotspot: does it originate from processes operating only in the shallow portions of the Earth's mantle, or from a deeper-seated feature, perhaps a mantle plume generated at the core-mantle boundary? The resources linked from this page include an assortment of web- and non-web resources, published papers, abstracts, and graphics. Direct links to web resources are followed by a "more info" link that gives a short description of the web resource. These resources by no means comprise a comprehensive treatment of the literature on the subject, but should at least give you a place to start in your study of the origin of the Yellowstone hotspot. Background: What are mantle plumes? Mantle plumes are thought to be zones of upwelling hot mantle rock, the surface expressions of which often include large igneous provinces, oceanic islands, seamounts, continental flood basalts, and linear volcanic chains in the oceans and on the continents called "hotspot tracks". The mantle plume concept was first proposed by Morgan (1971) (more info) and was based on Wilson's (1963) ideas that stationary hotspots in the shallow mantle underlay island/seamount chains in the deep ocean, and that the motion of crustal plates over these hotspots was what produced hotspot tracks. The Wilson-Morgan hotspot-plume theory comprised a key piece of evidence for the new theory of global plate tectonics which emerged during the late 1960's and early 1970's. For some background information on the evidence and development of the hotspot and mantle plume theories, please see the chapter on hotspots and mantle thermal plumes (more info) in the online text "This Dynamic Earth: The Story of Plate Tectonics", published by the U.S. Geological Survey. The identification of the Yellowstone - Snake River Plain goes back to the origination of the mantle plume concept by Morgan (1971) (more info) , and a variety of evidence supports at least an upper mantle origin of the geologic features along the Yellowstone-Snake River Plain. Here is a list of resources which summarize the geology of the Yellowstone hotspot track, from its inception to its present activity in Yellowstone, as well as its effect on the regional geology, geochemistry, tectonics, and paleolatitude/paleoclimate of the Pacific Northwest. Until recently, the dominant model for the origin of hotspot tracks like Yellowstone and Hawaii included some important assumptions: (1) that the hotspots were "fixed " in the shallow mantle under the active terminations of hotspot tracks, and (2) that hotspots are the results of deeper mantle processes involving the buoyant upwelling of plumes of mantle rock, possibly from the core-mantle boundary. Both of these assumptions have been challenged and debated in recent years.